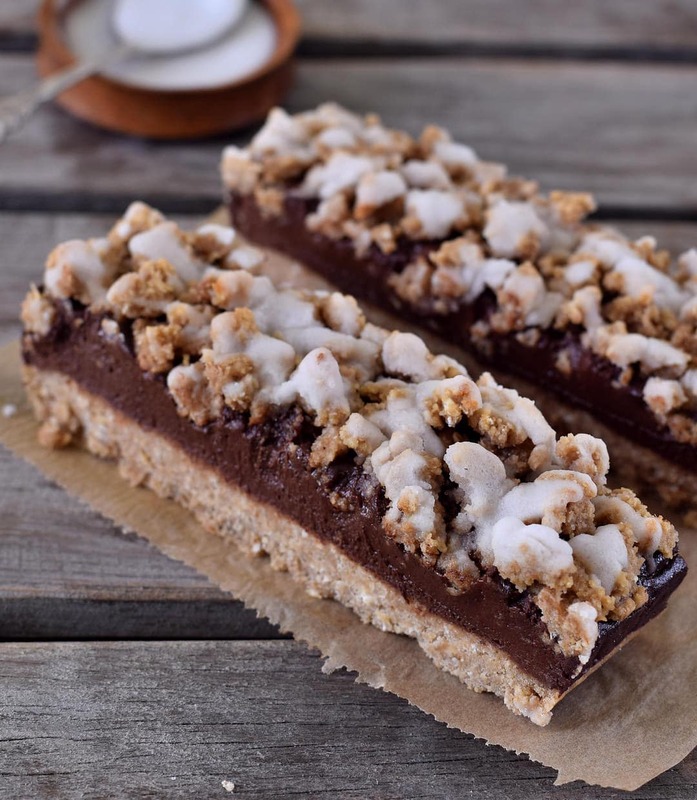 Do you sometimes think: “What could I have for breakfast today… how nice would it be to grab some oat breakfast bars which are already sitting in the fridge and waiting for me to be eaten? 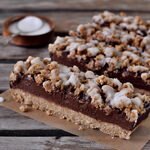 !” Well, then look no further, because these easy to make oat chocolate banana crumble bars are great for breakfast. They can be stored in the fridge for about 5-7 days, so make them on a Sunday, and enjoy them during the next week. We all want a fast but healthy breakfast and it can be boring to eat oatmeal every morning. That’s why I came up with the idea to create these healthy oat breakfast bars. They contain mainly oats and bananas but I couldn’t resist adding a delicious chocolate layer. 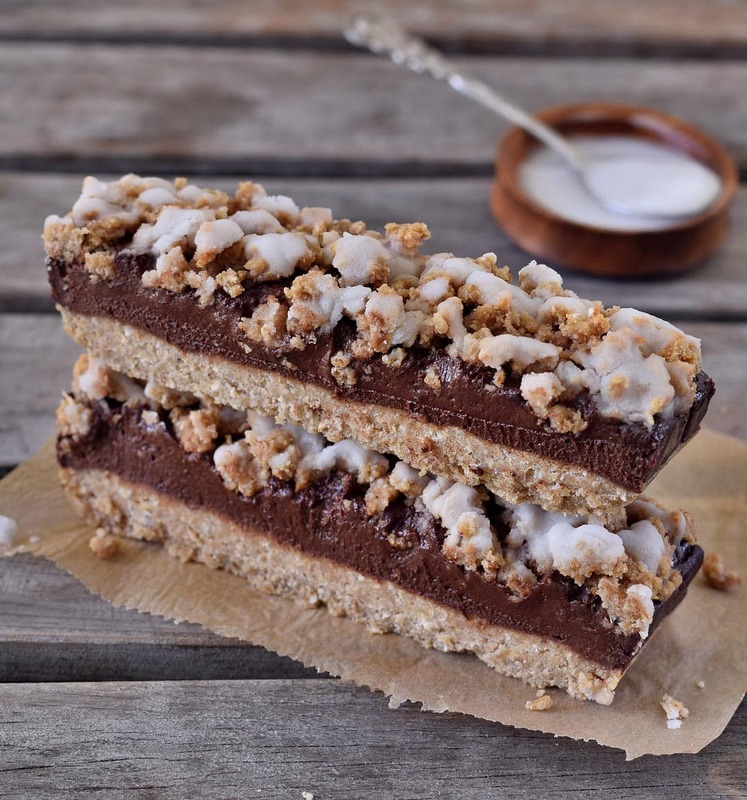 But wait, the chocolate layer also contains only healthy ingredients, including bananas and dates! And I added some crumble on top because who doesn’t love crumble?! Well, I do, and I always eat the crumble first, because it’s the best, right. These oat breakfast bars are vegan, gluten-free, refined sugar-free and easy to make. Like mentioned before, the main ingredients are oats and bananas. You can use regular rolled oats or instant oats (both work well), and if you have celiac disease then definitely use gluten-free oats. If you don’t like bananas then this recipe probably isn’t for you because it contains 4 bananas. I also added almond flour, however, if you can’t eat almonds, then you could use dried, shredded coconut instead. For the liquid sweetener, you can choose between maple syrup and rice syrup or any other liquid sweetener of choice. The chocolate layer contains bananas, dates, peanut butter, cocoa powder, vanilla extract and that’s basically it. Pretty easy right?! If you are allergic to peanuts then you could use any other nut butter (coconut butter, almond butter, cashew butter etc) or seed butter (sunflower seed butter etc). These oat breakfast bars are perfect to take with you to work, uni or school. They are a great snack on the go or can be enjoyed as a dessert. If you are looking for another “snack on the go” recipe idea, then also check out my healthy granola bars. Please leave a comment below if you make these oat breakfast bars. You can also make a photo of it and post it on Instagram (or send me a DM). If you tag me in the caption + photo with @elavegan and use the hashtag #elavegan I will gladly check out your post and leave a comment. 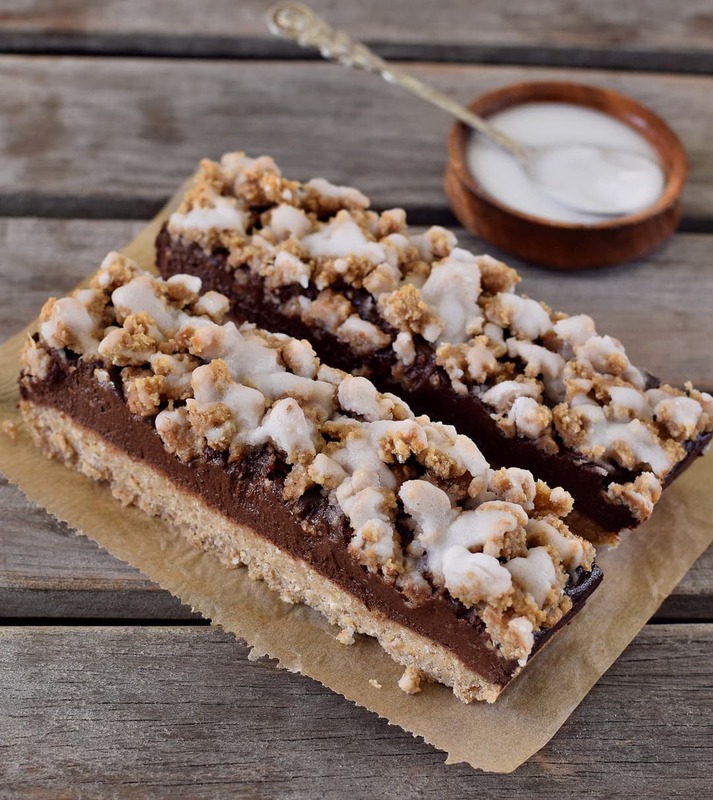 Drizzle some icing, chocolate cream or peanut butter on top (optional) and enjoy your oat breakfast bars! Store leftovers in the fridge. Thank you very much, Dee! Yes, you are right, oats contain so many amazing nutrients. I really love using oats in my recipes. 🙂 PS: I would love to try your pink donuts, haha ???? This is such a great snack to take away ???? Any other option instead of the banana? For us who don’t like banana 🙂 anything else I can use to substitute? If oatmeal and a chocolate bar and a streusel muffin had a baby…these would still be BETTER! Ela this ingredient list is just perfect–all my favorite things. And that thick layer of chocolate is mega get-out-of-bed motivation, but also means they could double as dessert which I always love. So much YES???????? These bars look INSANE! 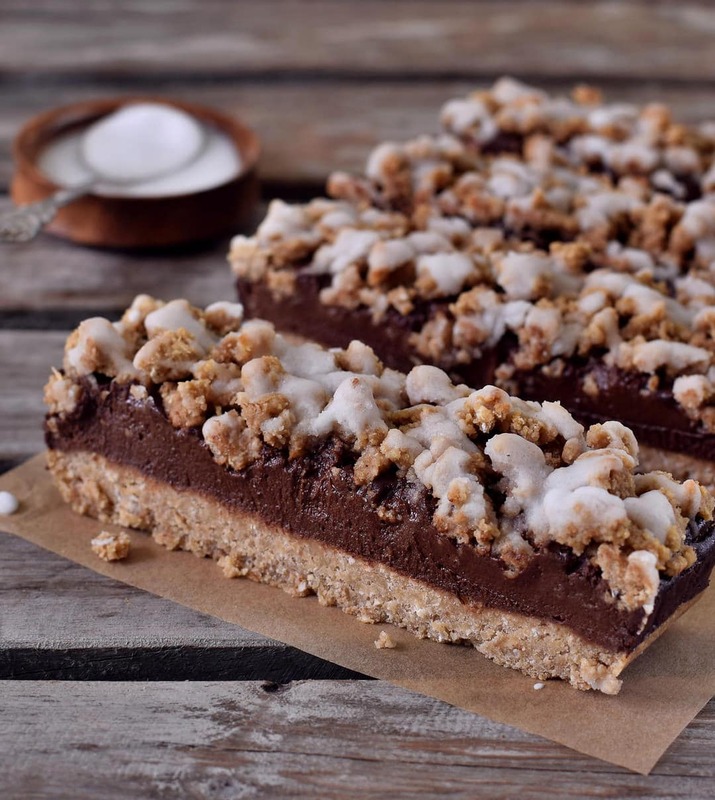 As always, made with healthy ingredients but looks so decadent! The only thing stopping me from making them is that I don’t have a 7×7 inch pan hehe. I’m very excited to try these. For someone who isn’t too familiar with how much 200 g of dates is, about how many cups or individual dates is that? Thanks! Can I use a blender since I don’t have a food processor ? Can I use coconut flour instead of the oat flour? I never used coconut flour instead of oat flour. I think it could work, however, you will probably need less, since coconut flour is very absorbent. The chocolate layer and asked when they will be ready! Thank you Ela for sharing such a great recipe with super healthy ingredients. 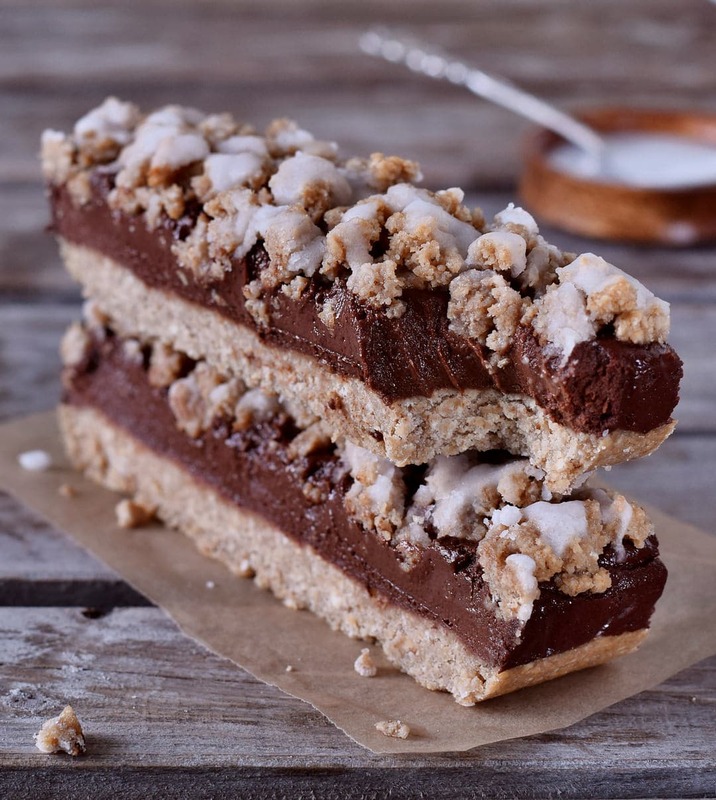 Will defiantly make this bars for tomorrow’s breakfast. would it be ok to freeze them? How long would they last in the fridge? Hi Elena, yes that should be no problem. I guess that if you put them into Ziploc bags they will last for at least a couple of weeks. Your recipe seems very interesting and healthy as well. One thing I would like to know that why is the oat mentioned twice in the list of ingredients ? Tastes so good when it’s cold. And the chocolate layer is perfection! I topped it with raw honey because I can’t find Erythritol where I live. I think it will be even better with a hard shell chocolate sauce on top. Thanks for the recipe. Willndef give them a try! How long they last i the fridge? Thank you. A couple of days. You can also store them for weeks in the freezer. These are surprisingly good! I drizzled melted dark chocolate over them and they look amazing too! They are a really filling breakfast or snack. Thank you for this great recipe! Do you think these could be made with sweet potatoe? Not sure as I never tried it out. Hi! How long can you keep it in the fridge? Can you freeze it? Do these have to be kept in the freezer? I’m assuming because you used so much banana that they fall apart rather easily at room temperature. Another concern is that because the ingredient list is so clean, that they taste “healthy”. Do you know what I mean? 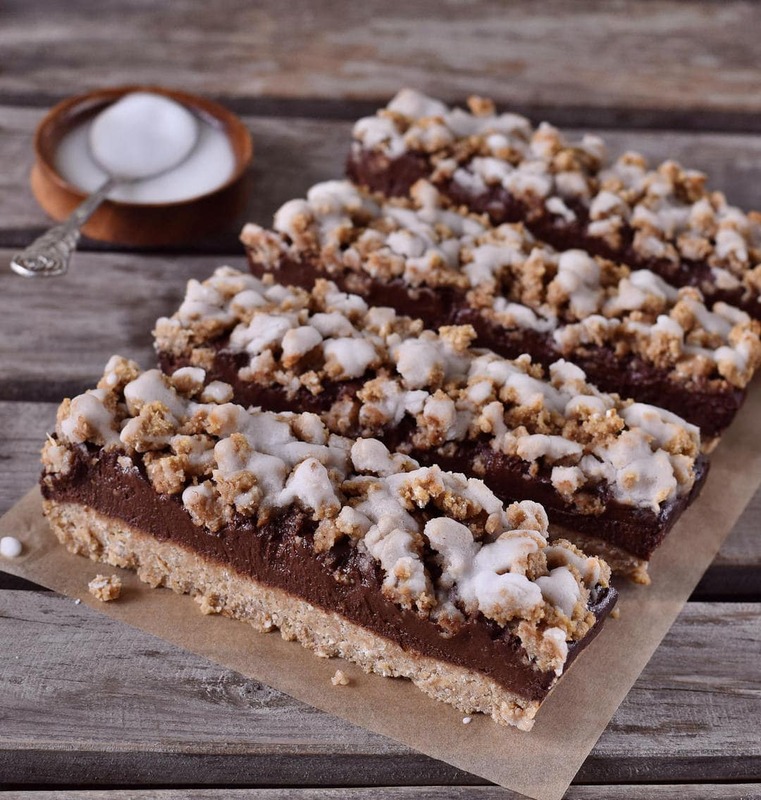 Like “I get what this is trying to be: decadent, reminiscent of the Starbucks oat fudge bar/strudel, but it tastes TOO healthy to really hit any of those marks”. Can you use thawed, frozen bananas or do they need to be fresh? I never used thawed, frozen bananas in this recipe, however, I believe the bars would end up too sticky, so I would recommend using fresh bananas. Amazing and easy recipe! Great for breakfast and snacks! These look so good! What a perfect healthy breakfast meal prep!